Pen-and-ink drawing of two sculptures from Cave I, Badami, depicting Harihara and Ardhanarishvara, by an Indian draftsman, dated 1853.
the town. Around the south fort there are four rock-cut cave temples. Cave I is the earliest of the rock cut caves of Badami and belongs to the late sixth century. It consists of a long outer porch, a large columned hall (mandapa) and a small square sanctuary. Large sculpture panels are carved on the sides of the porch. 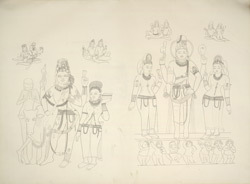 The figure to the left in this drawing is Ardhanarishvara, a half male and half female figure, a combination of Shiva and Parvati. Near the Shiva side there is Shiva's vehicle, the bull Nandi and an emaciated figure of a sage man, the Rishi Bhringi. On the side of Parvati there is a female attendant. Ardhanarishvara has four hands, two of which hold a lyre (vina). The remaning left hand holds a battleaxe and a snake and the remaining right hand a lotus. The figure to the right in the drawing represents Harihara, a combination of Shiva and Vishnu. The Shiva side is indicated by the presence of the battleaxe with a snake and Parvati standing on the god's right; the Vishnu side is indicated by a conch and the presence of Lakshmi on the left of the god. He stands on a pedestal with a carved panel of dwarves, the ghanas. His headdress consists of matted hair with a crescent on it while the other half is a jewelled crown. Over his head there is a flying couple (gandharva) on each side of the wall.